Facebook authorized $6 billion in share repurchases. On Facebook's (NASDAQ:FB) third-quarter earnings call in early November, CFO Dave Wehner told analysts 2017 would be a year of "aggressive investment." But apparently there's still room in the budget for a potential $6 billion in share buybacks, which the company's board approved on Nov. 18. The share repurchase authorization will go into effect in the first quarter of 2017 and has no set end date, so it's less about capitalizing on the recent downturn in Facebook's share price than about providing another option for Facebook to deploy the $26.1 billion in cash and equivalents sitting on its balance sheet. The move echoes a similar move made by Alphabet (NASDAQ:GOOG) (NASDAQ:GOOGL) last year, when it announced a $5.1 billion share buyback authorization with $73 billion in cash on its balance sheet. In Facebook's SEC filing announcing the share repurchase authorization, management made it clear where its priorities are, saying that the "timing and actual number of shares repurchased will depend on a variety of factors, including price, general business and market conditions, and alternative investment opportunities. The program will be executed consistent with the Company's capital allocation strategy of prioritizing investment to grow the business over the long term." Indeed, Facebook has not shifted its focus one bit in investing in the long-term growth of the company. But with rapid growth in free cash flow over the past few years, it may not be able to spend that cash in an efficient manner. 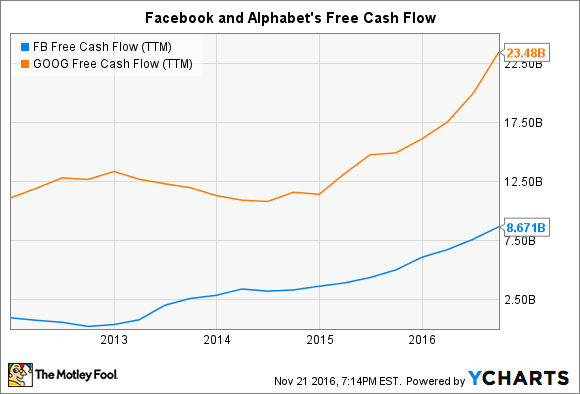 Alphabet has also experienced a recent acceleration in free cash flow generation, and with a cash pile significantly larger than Facebook's (or almost any other company's for that matter), it was prompted to start returning capital to shareholders. A repurchase authorization provides more flexibility than a dividend, making it more appealing to companies that still plan to invest in growth like Alphabet and Facebook. Investors should still expect 2017 to be a year of aggressive investment, as Wehner told analysts on the third-quarter earnings call. The company's primary focus is on attracting top engineering talent and the buybacks could play into that. One of the main ways to attract and retain talent, as Facebook plans to do, is to offer equity in the rapidly growing company to new employees. Through the first nine months of 2016, Facebook has awarded $2.4 billion in share-based compensation. Assuming the fourth quarter keeps pace with the rest of the year, Facebook will dole out shares worth over half of its share repurchase authorization in 2016. As such, Facebook's share repurchases may serve mostly to offset share-based compensation, keeping outstanding shares relatively stable. The authorization isn't so large that it will have a huge impact on earnings per share -- $6 billion represents about 1.7% of Facebook's total market capitalization. For reference, analysts currently project Facebook's earnings per share to grow 27% year over year in 2017. If anything, the share repurchase authorization is a sign of confidence from management that Facebook will continue to grow its free cash flow. With an expected slowdown in ad revenue growth due to saturated ad load in Facebook's News Feeds, investors are expecting a significant slowdown for the top and bottom lines after both accelerated in 2016. While the authorization doesn't obligate the company to buy back shares, it wouldn't have announced anything if it wasn't confident it would have the resources to execute it. Arguments can be made that Facebook would be better off finding other investments besides its own stock. Corporations, in general, have terrible timing when it comes to buying back their own shares. Facebook has, however, executed relatively well in deploying capital to acquire companies or develop new technologies. But with a growing stream of cash flow, it's nice to have the option to simply buy back shares, offset share-based compensation, and improve its earnings-per-share numbers.